In a large pot, add ground beef, onion, bell pepper, garlic and House Seasoning blend and cook over medium high heat until meat is no longer pink. Stir chili seasoning mix, brown sugar, chili in adobo and flour into meat mixture; Cook for 2 minutes. Add crushed tomatoes, squash, kidney beans, black beans and corn; Stir until combined. Reduce heat to medium, cover and cook for 30 minutes or until squash is fork-tender. Instead of a regular bowl, serve the Chili in Bread Bowls to make a delicious meal. Use the Chili over Baked Potatoes and then use Melted Cheese. 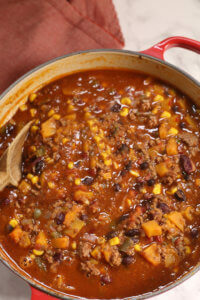 This Spicy Chili Recipe Freezes great too!